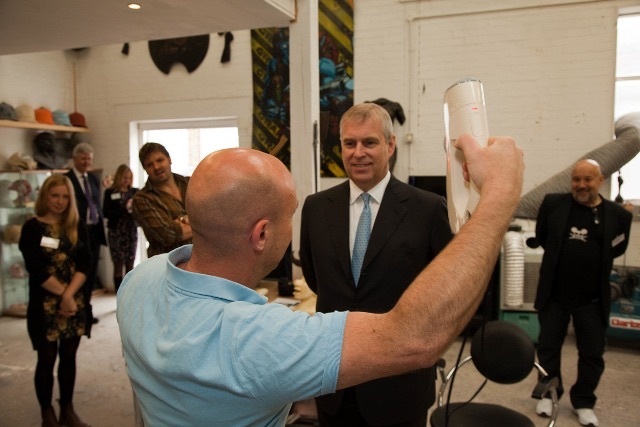 On a tour of Elstree Film and Television Studios in June, Britain’s Prince Andrew got curious at all the hustle and bustle happening in the corner. Fascinated by the strange process, he expressed an interest in trying it out himself. Lifecast/Life3D studio team quickly executed his facial scan with Artec Eva. A minute later, a life-like, 3D digital copy was staring back at him from the computer screen. It seems that even royalty isn’t immune to the charms of this technology. So we are waiting for Facebook and Twitter to catch on and allow everyone to upload true 3D pics. The Prince could have tweeted his cool 3D image to all his fans. Life3D (supplied by Artec’s UK reseller Patrick Thorn & Co) provides high-profile scanning services used in film, TV, scientific and arts industries.